“Health is Wealth”-–needless to say about the truth of this proverb. Health is a state of complete physical, mental and social well being. A routine balanced diet, physical exercise, leisure and sound sleep without drug help keep good health. A good digesting power—a good physical and mental condition and resistant power are the signs of good health. A healthy person has more energy for work. The person can work better, earns more and lives more comfortably. So, one must pay some extra effort to be free from pollution or contamination. Specially pay attention to our previous guideline on Grooming & Hygiene for Servers and tips on Safe Food Handling. In the hotel industry we mainly emphasize to be alert on the above three ways. The standard of good personal hygiene during the hours of service must be maintained by all personnel in the hotel industry, because the appearance of staff reflects the standards of the house in the eyes of the customer. The last look in the mirror will be the customer’s first look. Most people carry some kinds of pathogenic bacteria within their body and staffs have a responsibility to respect themselves and others by observing the highest standards of personal cleanliness to ensure that they do not contaminate others and the working environment. Hands are the main media to communicate bacteria and impure substances form one another. Chemical here refer to perfumes, lotion, antiseptic appliances, make-up, cosmetics etc. which people use according to their choice, taste and suitability. In the instances of someone meeting a friend, it is quite common that they shake their hand or hug each other. If the perfume or cosmetics etc. do not suit anyone, the meeting may not be a sweet experience indeed! It may also happen that one is allergic to the chemical used by the other. The meeting may end up with some hazardous consequences too. Always wash your hands in the special wash-hand basins. Use boiled water and disinfect soap. Use a clean nailbrush to clean under nail. 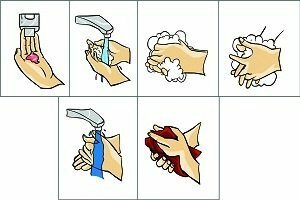 Rub hands together thoroughly then rinse under clean water. Do not comb your hair or put on make-up in the public areas. Do not spit. Cough or sneeze openly in the public areas, use a tissue and wash your hands afterwards. Do not pick your nose or teeth or scratch your head. Do not smoke in the guest areas or public areas. Do not use your uniform to wipe your hands. Do not lean or sit on work areas. Do not leave rubbish and waste materials lying around, put into a covered refuse bin. Maintain your daily routine for personal cleanliness. Immediately after using the toilet. After sneezing or boiling your nose. After handling dirty equipment, paper and after using chemical substances. Change socks and underclothing everyday. Brush teeth at least twice a day, preferably before going to sleep at night. Wash hair frequently, keep hair and breads neatly trimmed. Keep finger nails short and clean; avoid using excessive amounts of nail varnish, make-up and perfumes. A man be affected by disease anytime, in this circumstances, you must inform your supervisor that you are suffering from a cold, sore throat, diarrhea, upset stomach etc. your superior will decide whether you should be on duty or not. Maintaining personal hygiene is not only your job requirement; it rather benefits you in keeping yourself in a sound health. As you get the habit of maintaining all the above rules, you will see yourself what wonders these do to you. Just try these. lts really helpful for the person who works in hotel induestries.